It has been a grey dismal day here today at the cottage (caravan) – we decided to sneak away for a few days with the hope of better weather and yesterday it was pleasant enough to be in the garden but today we are back to cold and wet. When we cleared some of the upper wood on our last visit at the end of February (if you can remember so far back) we ended up with stacks of rotting wood and trailing ivy and not a hope of burning it in the gales. However, yesterday was mild and calm so perfect for a bonfire. It won’t be long though before I generate another pile – it is an ongoing job here. So far I have made a pathway through the wood. The old concrete bunker on the right makes a great log store. It is a left over outbuilding from when the pub at the top of the lane was a Creamery and until the seventies this land was just a field with no trees. In the afternoon DH found time to cut the lawns and I did a bit of weeding in the borders and pruned some of the Hydrangeas. The ones by the conservatory had grown too big and so I have cut them back hard and will probably have to sacrifice some blooms later on although last time I did this they still flowered despite the gardening books saying they wouldn’t if cut back too far. It is very noticeable that everything in the garden is very late compared to other years and so I was quite surprised when I came across the Delphinium bed and some of the plants are already a good foot high. I can almost hear their tender shoots calling to the rabbits ‘eat me eat me’ – hence I have them well protected with chicken wire! The grand fernery beside the pool with the majestic Royal ferns is a sorry sight at the moment – all the leaves have been burnt by the cold weather and salt spray and are shrivelled and brown and will have to be cut back to ground level and wait for the new growth. I spent ages doing this last year and usually only need to do it every other year if the winter is milder. The Fatsia is the same. I will leave both for now just in case it remains cold and we have some heavy frosts. We had a brisk walk into the village and back tonight just before the light went. There had been talk of adding solar lights along the ‘low road’ which is the old road that runs alongside the beach and is just a pathway now, not accessible by car. If you walk along here in the evening it is a real treat as you can hear all the hedgerow birds in full song. I for one am glad that the solar lights have not materialised as I think it is not the place for light pollution it is a quiet place for the wildlife to live undisturbed. It is only 20 days until we go to Italy eeek…I still have to resolve the footwear and handbag problem. I still have to resolve transport to and from the wedding and reception. I still have to resolve what exactly is the breakfast at the hotel when it is only 3 Euros? Hoping for a sunny day tomorrow. Hi everyone – I hope you all had a lovely Easter despite the weather. It is nearly a month since my last post – apologies for that it was unintentional – time just flies by and before you know it a whole month has passed. I have been reading and keeping up with my usual blogs – sorry for the lack of comments – and I know I have some new followers whilst I have been hibernating so welcome to my little blog. We have had a number of deaths and funerals to attend since the beginning of the year – I have another funeral of a friend next Monday but we have had one very sad and unexpected death of a family member, a little boy – it is always dreadful when someone dies but far worse to cope with when it is a child. So much sadness and together with this cold, dismal weather it has left me a little drained and feeling rather miserable and unfocused. 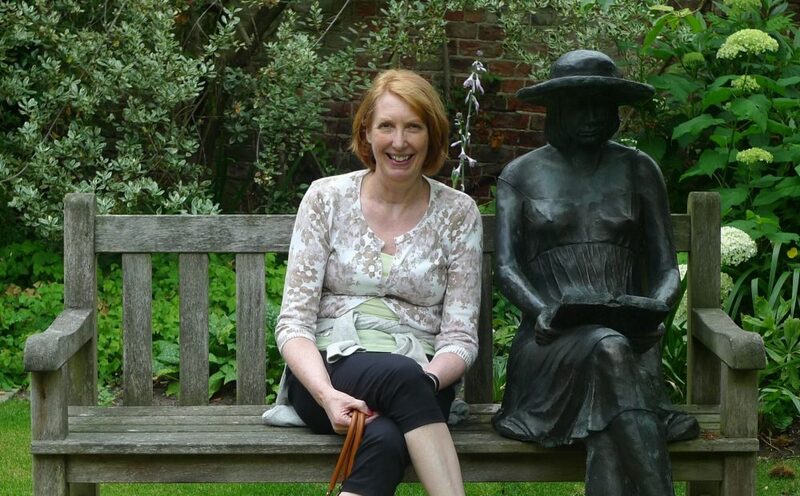 Work too has been a struggle – I don’t feel I fit in any more – I miss my colleague Helen more than ever – it would have been her birthday on 2nd March – I met her mum in town for lunch – we had a lovely chat and catch up which was nice and we could remember Helen together. Many of my other friends and colleagues at work have left the firm one by one recently and each day I keep thinking it really is time for me to leave too. It is only the beginning of April and already I feel like I need a fresh start. Hopefully a bit of sunshine will help – when it eventually arrives. As I look out on my garden it is still very brown – I have evergreen shrubs that are now brown too and I am not sure they will recover – the cold temperatures certainly did a lot of damage. The Cherry tree has no sign of life yet and only a few daffodils are in flower – everything seems so late. I dare not prune in case we had more snow and cold weather and when I woke up to snow yesterday on Easter Monday I was thankful that I hadn’t dashed out with the secateurs on the one sunny day we had recently. Anyway I ramble on when the point of the post is to review my progress for March before setting my new intentions for April. I abandoned this category altogether – I bought a packet of Easter cards and some of the birthday cards. I didn’t feel like making Sympathy cards so bought these as well. We attended the Pensionwise meeting – the guy was quite informative and helped us to see certain aspects in a different light – but the difficult bit is still to come, finding a genuine IFA, making the choice of what to do with the pension pot and when to do it. The eBay selling has been really good we have sold all the large items we had listed and we have even put on a couple of items now for our daughter. As we are going to Italy near the end of the month we will have to take a ‘listing’ break but when we return I have a whole new list of items to sell and I haven’t even started on the ‘stuff’ in the loft yet! Surprisingly we have earned about £300 hundred pounds so far and this will help towards our holiday. I bought mum a present for mother’s day from a lovely little shop in Stranraer called Baxters – a soft fur scarf in a muted pink with a scattering of gold sparkle – mum was delighted, she seems to be collecting scarves at the moment and the colour was just right and she loves a bit of sparkle. I got a good deal on my new car insurance with LV by taking out their multi car policy and I was able to knock off the breakdown cover as that comes free from Hyundai. I also used my Boots vouchers for a new mascara and face cream and took advantage of the Neal’s yard and Bodyshop offers on the frankincense serum and Vitamin E creams I use – a bit of an outlay but it will save me money in the long run. I haven’t totted up my spending for March yet that will have to be another post another day. The garden tidy up didn’t happen mainly because of the bad weather but also once I had started on the office clear out I did not want to break off on the only sunny day we had. The shed has gone now though but the guy who is doing the repointing has been rescheduled for better weather and after our Italy trip. I had my hair cut shorter again, it is much easier to control in the mornings now and has a bit more bounce. The fresh fruit in the morning continues – my favourite mix is oranges, pink grapefruit, kiwi and blueberries – the zingy colour combination looks quite healthy! The exercise hasn’t happened – I have no excuse other than the usual such as time, inclination etc – I will endeavour to try again this month. I went a bit astray on the neatening this month – I should have been concentrating on my wardrobe – and although I have been making plans for decorating and fitting it out somehow I found myself clearing out the office instead. I think this all started when I had to get the Pension papers down from the loft and one thing led to another. And now I am on a mission. It has been a big job as the office is all paperwork and craft stuff not to mention the man drawers full of unidentifiable cable and leads – but they are not unidentifiable anymore! At the moment I feel I have exhausted my decision-making capability and I am hoping I haven’t got rid of anything I should have kept. I will go into my clear out in more depth in another post. So there we are not all of my intentions fulfilled last month but I have got through quite a lot in between funerals. April will be a month on hold I fear as the trip to Italy is coming up at the end so it is pointless starting too many new projects as there is plenty to do to get ready. I will leave you (not for quite as long next time) with a picture taken in 2015 on the journey home from Scotland. April 2015 – Scotland – after a sudden snowfall on the hills. Back home, safe and sound now and back to work too this morning. Tonight it felt like last week and the snow never happened – all melted away and everything quite calm. Yesterday we journeyed 250 mile through parts of the country that had experienced heavy snow and the only road that wasn’t cleared was the one we live on – the forgotten cul-de-sac, forgotten by the council as they never send a gritter or snow plough down here. As we live on a hill and can only get out by going uphill most residents have to park their cars on the road going down to the village when it snows – it is safer and usually more passable. It wasn’t easy getting back into work today – I spent more than an hour alone reading the emails waiting in my inbox – most of them about the weather and who had struggled in and who was working at home and the offer of a free breakfast butty from our employers to the ones who had braved the snow. I was very surprised to find the auditors had decided to call off their visit last Tuesday – they were put off by the threat of snow so after all that hard work preparing before my week away we have to wait now until after Easter. After work we headed to Sainsbury’s to do the weekly shop – the vegetable aisle was quite bare in places, no cabbage, cauliflower or courgettes, the suppliers having difficulty providing the goods because of the snow. I took advantage of a few grocery items on offer and stocked up on fresh eggs and bread – have you noticed toilet rolls are becoming much smaller, when I came to put them away tonight we had an old one at the back of the cupboard it was both taller and fatter than this more recent equivalent. The second item we listed on eBay, the curved shower screen, has now been sold and waiting collection so on Thursday my first day off we will be listing a few more items – DH has already written the information ready for me to proof read and then we will have to decide on a price. I don’t think this time round I will take that much notice of the eBay suggestions on price – I think we could have got a little bit more than we did for our goods given they were brand new and discontinued so very useful for the people who have bought them to be able to get hold of them – I know we have been in this position ourselves trying to find something that has been discontinued so I am more than pleased we have been able to help these buyers out. We arrived home yesterday to only two letters after over a week away – that must be a first. Usually we can’t open the door – though a lot of the mail waiting on the mat can often be junk. We assumed that the postman probably hadn’t got round with the snow – we were probably right as today we had a flurry of mail. Amongst the usual kind of business letters – my annual tax summary, annual pension statement, new terms and conditions for our banks etc (so plenty of bedtime reading) I had been sent a £5 reward voucher from Wyevale to use at their garden centres and a 20% off Neal’s Yard voucher code – so I can use this to buy my next lot of face cream and serum (one of my indulgences – I only hope it is working, but how would I know what my skin would be like if I used something else? I can hardly compare unless I use different creams at the same time on the different halves of my face – but that sounds far too complicated for me! Well my cosy bed beckons and I need my beauty sleep just in case the face cream needs a lot of help to rejuvenate my ageing skin. I had to improvise with my header for my March intentions as we are still at the caravan – so with the help of the front cover from my Country Living magazine I managed to cut out the letters using their picture of spring flowers! After listing far too many intentions last month I have tried to cut down this month to give myself a chance of completing more of them. March is always a busy month for me with Mother’s day coming up and this year Good Friday falls at the end of the month on 30th March. We will need to fit in a trip up to North Yorkshire – weather permitting as well as another visit to the cottage. Most of our additional spending this month will be on gifts for Mother’s day and Easter so this won’t be a huge outlay but the visits will take petrol money and probably a trip to a tea room. On the bills side we will have my car insurance to renew and a quarterly water rates bill but we have a month free of Council Tax. On the plus side I am looking to bring in more money – the extra overtime at work and more sales on eBay, but the biggest savings are of course on not being tempted to spend in the first place on items I really do not need. So staying away from the shops will be key. We need to save as much as we can now to put towards our Italian trip – the taxi alone to the wedding for 7 of us has been quoted as 120 euros for a 12 mile trip (mmm I think we are being taken for a ride!) – we are presently looking into the bus times but not speaking the lingo it is hard to know if there is even a bus that would get us there in time. I intend to plan our menus for March again to limit the amount I spend on food. Most of my overspend last month was taking advantage of the groceries on offer. I am not keen on stockpiling as it goes against the simplistic / minimalistic lifestyle but I think having extra of what we do use is better than having cupboards stuffed with foods we never use and I try to avoid having hoards of stuff we will never eat. At this time of year the vegetables we have been enjoying are still around – Brussel Sprouts, cabbage, cauliflower, broccoli and leek but soon we will see Spring greens making an appearance and this is a good season for watercress. As the weather improves (I hope) I will need to search out my ‘lighter’ recipes to reflect the coming season and make meals using the same vegetables as the winter months but in recipes that are not quite so dense and heavy. Instead of having a potato topping on my Shepherds Pie I will use cauliflower or broccoli rice, instead of a thick stew I will be doing a lighter casserole with less potato and swede. Birthday cards – make 2 cards for friends and one for sister’s wedding anniversary. Pensions – attend free advice appointment and book further appointment with IFA. Continue reorganising the wardrobe in the main bedroom and mending or decluttering any unused items of clothing. Even though I carefully shortened my list it still seems like quite a lot but I find that setting some targets helps me to keep focused…what will you be doing in March?